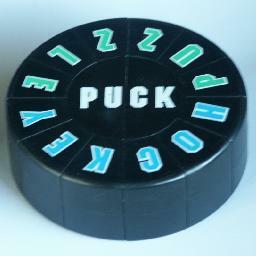 The puck is a puzzle in the shape of a hockey puck, i.e. a thick disk. In the centre are two semicircular parts, and around these are 12 segment pieces. The centre can rotate with respect to the segments, and one of its halves can be given a 180 degree turn to change the order of the segments. 1. Numbers 1 to 12, with 'Hockey Puck Puzzle' on the other side. 3. Rainbow colours, two pieces of each colour. The Hockey Puck was patented by Zoltan Pataki, Udulo Mszmp, and Geza Csomos, on 7 March 1991, WO 91/02574. The mechanism is virtually identical to that of the earlier Kép Korong. There are 12 segments giving a maximum of 12! positions relative to the centre. The orientation of the pieces is not important since it depends totally on their position. Assuming the centre has distinguishing marks then it has 2·2 possible orientations, giving a total of 4·12! positions. Given an arrangement of the outer ring, not all of the centre orientations are possible because each half twist is an odd permutation. This leaves 12!·2 = 958,003,200 positions. If rotations of the centre are not considered different, then there are only 11!·2 = 79,833,600 positions. The rainbow puck has six pairs of identical pieces, so it has about 26=64 times as few positions. Some positions have 180 degree rotational symmetry, so to get the exact number of positions we can use Burnside's Theorem, which gives (12!/64+ 6! )/12 = 623,760 positions. David Joyner's page Has a short description of a cumbersome solution. Shift the outer ring so that the piece you want to move lies at the top of the right half, just to the right of the seam. Turn over the right half. Turn the outer ring one step anti-clockwise. Turn the outer ring one step clockwise. Do steps b-e a final time. The effect of this sequence is that the piece mentioned in step a is shifted clockwise 6 steps, i.e. jumping over 6 pieces. The other pieces do not change their order, though the 6 pieces jumped over will all have turned over. You can apply this move sequence twice on the same piece, so that it jumps over 12 pieces all together. Since there are only 11 other pieces, the net effect is that the piece has really jumped over only one piece. In other words, the piece has swapped with the one to the right of it. In this case all 10 of the other pieces will have turned over. With this move sequence, it becomes quite easy to solve the pieces one by one. You can solve half the puzzle intuitively (or for details, see solution 2 below). Then use the move sequence to extend the solved block piece by piece. Throughout all this, the orientation of the pieces was ignored. This might lead to the situation where, at the end, all the pieces are upside down. If you get this, do one twist move and solve it again. If the centre halves have visible orientations then you can avoid this by fixing the centre after you have solved 6 of the pieces. Consider the 12 segments numbered like a clock face, 12 at the top. We will leave piece 12 fixed, and solve the remaining segments anti- clockwise, from 11 to 1. Therefore hold the puzzle so that the piece at the top is correct. If your puzzle has four blank pieces (e.g. Canadian Puck) then it is best to choose piece 12 so that the blank pieces will end up at positions 1-4. You will have to rotate the centre of the puck first to accomplish a move. I have used a computer to calculate God's algorithm for the puzzle, ignoring the centre pieces completely, and with either all 6 possible moves or restricted to fewer moves where you keep a block of adjacent segments stationary. The relevant numbers where the centre orientation is not ignored can easily be deduced from this. The last column shows that the segments can be solved in 15 moves (11.451 on average). In Sloane's On-Line Encyclopedia of Integer Sequences these are included as sequences A079735, A079736, A079737, and A079738. Segment 12: This is already correct. Find the piece that belongs in position 11. If it is at 11, go to the next step obviously. Otherwise do any move(s) to bring the piece to position 6, and then do move f to put it at 11. These can be solved in a similar way to piece 11, with the proviso that you must not do any move that destroys any part of what you have done already. Just see what the last move is that you would need to use to put the piece in position, and then do any moves you need to bring the piece to the correct spot for that move to work. I will not explain further as it is easy. 6. Do nothing since it is already correct. Find the piece that belongs in position 5. Then do the relevant sequence below. 5. Do nothing since it is already correct. 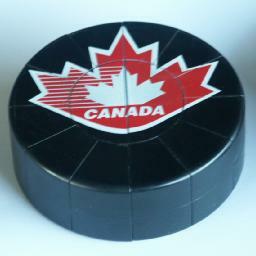 The Canadian puck is now done, except possibly for the centre. Go to the final step below. Find the piece that belongs in position 4. Then do the relevant sequence below. 4. Do nothing since it is already correct. Find the piece that belongs in position 3. Then do the relevant sequence below. 3. Do nothing since it is already correct. If all the pieces 1 to 12 are correct, it is impossible at this point for only one half of the centre to be reversed. On the Canadian puck it is possible however, since some pieces are indistinguishable. To twist half the centre in that case you will have to go back to the step above, and use it to swap two of the identical pieces. Having both halves of the centre reversed is always possible, and this can be avoided by making sure the correct half is turned on your final move in the steps above. If you have to correct it anyway, twist one half, rotate the centre 180 degrees and twist one half again. Finally rotate the centre to its correct position if necessary.